Here's a summer sale for your favorite brand of shoes with big discounts to score. Before the month of March will end, Shangri-La Plaza is offering a big dropping of its sports wear by giving the 80% off discount on its 'The Sports Warehouse's Big Big Sale'. 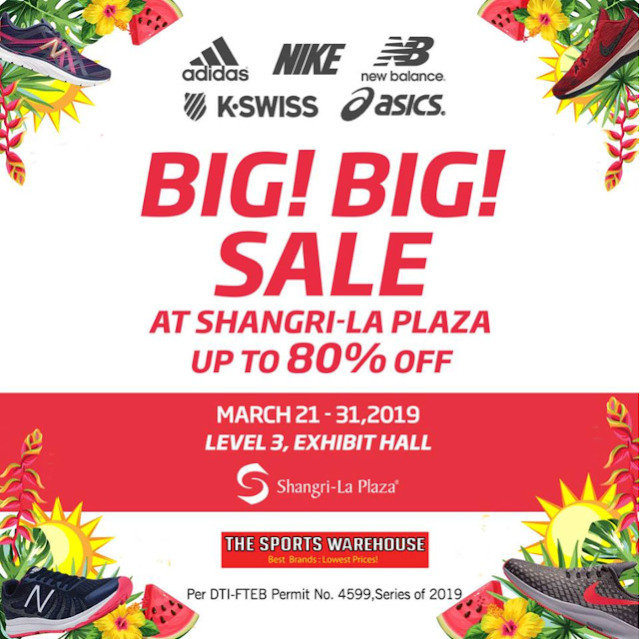 Get a chance to get your footwear and active wear accessories from brands like Nike, Adidas,New Balance, Asics, K-Swiss, and more when you shop at The Sports Warehouse in the Exhibit Hall, Level 3, Shangri-La Plaza, Mandaluyong City. Prepare your wallet because the sale will run from March 21 to 31 - but we suggest to go there on the first day of schedule to get a lot of choices with best deals.